This game has a lot more improvements over WCW vs. the World. More news on this game soon. Here are some screen shots. This game features lots of modes such as exhbition,league,tournament, battle royal and a lot more. 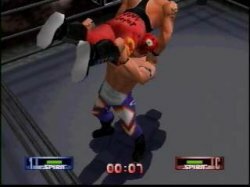 The game has 5 wrestling leagues: WCW,NWO,DOA(dead or alive),Independent Union,WWW(this is a hidden league).There are 13 wrestlers in WCW:Ultimo Dragon,Malenko, Mysterio Jr.,Luger,Flair,Rick Steiner,Scott Steiner,Sting, Giant,Guerrero,Benoit,Steven Regal,Page(in League Mode you can't pick page until you beat all of WCW's wrestlers).There are 9 NWO wrestlers:Holgan,BogusSting,Bagwell,Bishoff,Norton,Hall,Nash, Syxx,Savage.There are 9 wrestlers in DOA,10 in Inde. Union,and WWW has the best wrestlers from all the groups and 2 of its own. This game is a lot of fun.Get the Strategy Guide from Prima Publishing out Now.Here are some pictures of the game. Features 17 Wrestlers: Kane,Mosh,Thrasher,Undertaker,Ahmed Johnson, Bret Hart,Owen Hart,British Bulldog,Goldust,Shawn Michaels,Hunter Hearst Helmsley,Farooq,Rocky Maivia,Mankind,Ken Shamrock(N64 Exclusive),Steve Austin.and Dude Love. Lots of modes: Single,Title Tournaments,Tag Team,Royal Rumble,Gauntlet, Season,Steel Cage. 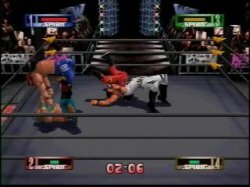 There'salso a special create your own wrestler mode with lots of moves and uniforms to choose from.Theres also over 600 moves in the game. Here are some pictures. 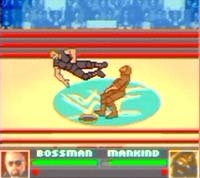 The Sequel to world Tour has much more better graphics and better modes.New features includes An edit wrestlers costumes, an updated WCW roster, A 40-Man battle Royal, an ref Marc Curtis is shown if you are about to submist and different championship modes to get secret wrestlers like Hennig,Kidman,Piper, and Kanyon.There are two fictitious leagues, the FLock, the NWO, and WCW.There are 14 NWO Wrestlers,5 Flock wrestlers, and about 30 WCW Wrestlers.Some new wrestlers are Raven,Goldberg,Reese,Sickboy,Riggs,La Parka,Konnan,Chavo Gurrerro Jr., Chris Jericho,and Saturn.Here are some pictures. Acclaims next WWF game will feauture the same button combination grappling system from Warzone. Their will be more than 30 wrestlers in the game from their Main Eventers like Austin, The Rock, Undertaker, and Mankind to the Midcarders like all of DX(even Chyna), D-Lo, Mark Henry, & Sable, to their jobbers like Too Much, and the Headbangers. Their will be a new Create-your-own-PPV feature where you can set where the location and arena its gonna be in, plus set all the matches and any stipulation or gimmick matches you want. The regular create-a-wrestler feature is in with a lot more to customize beside from what you could in Warzone. Their will be new gimick matches to select in Attitude like Lumberjack, and Ladder Matches. Their will also will be a new "Season" mode where you start off with a created wrestler working house shows to making his first TV appearences on Shotgun, then Heat,then RAW, and PPV's and get a belt. Look for all this and more. Here are some early screen shots from the game taken from March '99.